Offer the nutritional benefits of whole grains with these Lance whole grain cheddar sandwich crackers! Your guests will love the layers of cheese and hearty whole grain flavors. Plus, your customers are sure to recognize a name like Lance when selecting their next snack. Lance has provided satisfying snacks made with wholesome ingredients for over 100 years, offering classic and innovative snack varieties. For snacks of superior quality and timeless taste, offer Lance sandwich crackers at your restaurant, concession stand, extended stay facilities, or event! These sandwich crackers offer the creamy taste of cheddar cheese sandwiched in between two toasted whole grain wafers. They are individually-packaged with 6 crackers per package to control portioning and present a clean and sanitary appearance. Offering 4 grams of protein, 11 grams of whole grains and zero trans fat per serving, these crackers do not contain preservatives and are a healthier option for your vending machines. Provide Lance whole grain cheddar sandwich crackers at your convenience store or soup and salad bar for a delicious and more nutritious option for on-the-go snacking! Lance Whole Wheat Grain Cheddar Sandwich Crackers are bursting with flavor. With 6 sandwich crackers per package, these make a perfect snack. They're great as offerings in convenience stores, concession stands, and cafeteria lines. 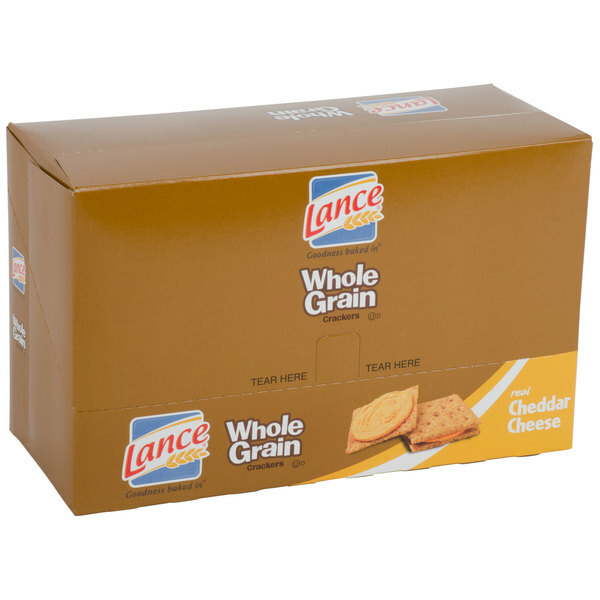 Lance Whole Grain Cheddar Sandwich Crackers are tasty. They're perfect for an afternoon or after school snack. They're also great in school lunches. They're also great offerings for convenience stores, gift shops, or vending machines. These tasty little whole wheat crackers are full of flavor. The individually wrapped packets are great for vending machines or convenience stores. They're also great for lunch boxes or a quick on-the-go snack. For being a whole grain cracker it is actually pretty good. Makes for a bit of a healthier snack. The portion size is perfect for me so I don't eat too many. Love the whole grain cheddar sandwich crackers. They are really crispy and love the strong cheddar flavor. Whole grain is so much better than the regular. These are nothing short of a miracle at our house. My son gets hypoglycemic when he hasn't eaten in a while and loses his mind with crazy tantrums. He especially needs protein at those times but never wants it. This is our easy solution - Protein from cheese, whole grains, and appealing to him even when he's over-hungry and over-tired. They are delicious. Thank you, Lance, for making these with no artificial colors! These whole grain sandwich crackers are a great tasting and hearty treat. Each cracker sandwich is filled with cheddar cheese. Full case of 120 packs is a great deal! 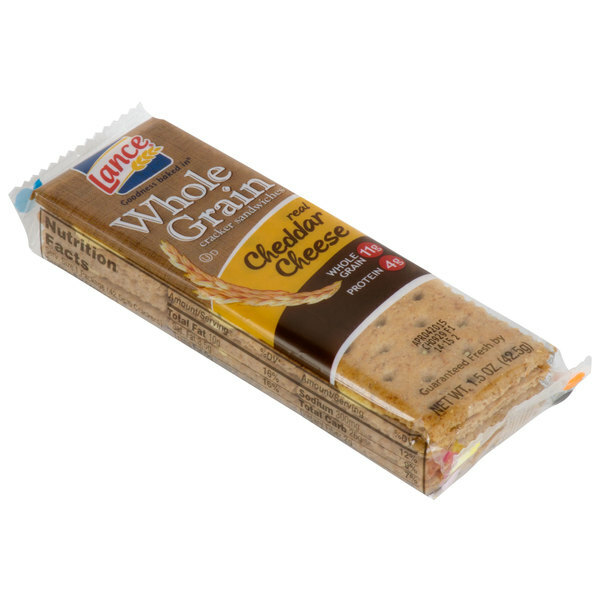 The Lance whole grain cheddar sandwich crackers are very tasty and great for making our snack bags for our hikers. The crackers are full of energy and the hikers love getting them in their snack bags. These whole grain cracker sandwiches taste great. Filled with a layer of cheddar cheese spread, these go great with lunches or just snacking. Good value here! These Lance cheddar cheese filled sandwich crackers are a great tasting treat. Each pack contains 6 cheese filled cracker sandwiches and a case has 120 packs, what a deal! 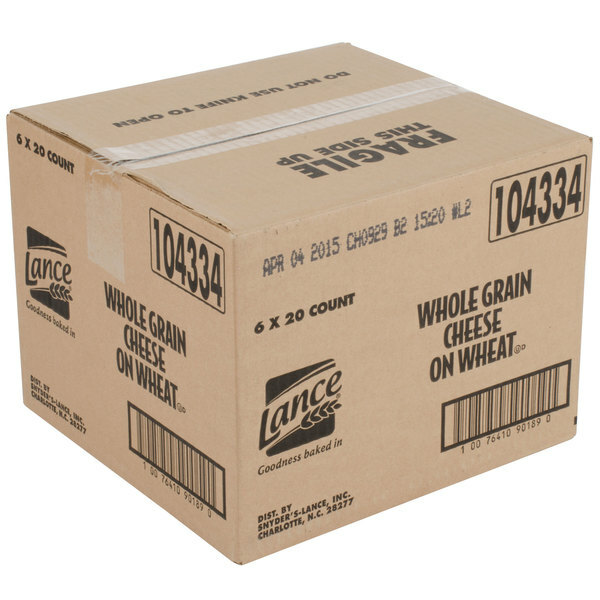 The Lance whole grain cheddar sandwich crackers are a great option for our hikers lunch bags. We host a hike every season and they love these crackers because they are whole grain. 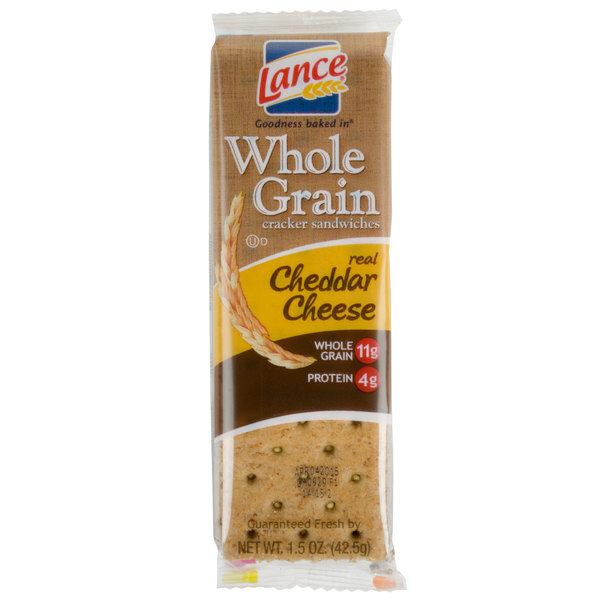 Lance Whole Grain Cheddar Sandwich was always my top choice when I would be offered an assortment of Lance sandwich crackers as a kid. All the flavors are great but something about the whole grain crispy, buttery cracker combined with the tangy cheddar filling, really spoke to me. These cracker packs are a great treat, snack, or the perfect remedy for hangry moments. Get the whole case at a great price! Fresh crackers right out of the box. This product is packaged in smaller count boxes that makes it super convenient. The bulk discount is a plus! Great tasting whole grain crackers for the price. Very healthy and conveniently packaged for travel or just to take along for a snack. Will not be without them.